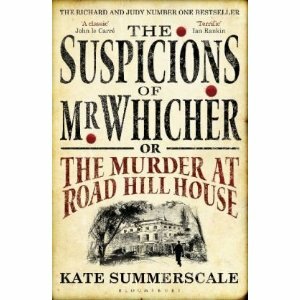 I’d picked up a copy of The Suspicions of Mr. Whicher by Kate Summerscale a while back when it was all the rage but somehow never got around to reading it. Considering I’m such a huge fan of crime fiction and mysteries and I used to read a lot of non-fiction about Jack the Ripper and the world’s wickedest murderers, etc. I just didn’t feel the urge. Maybe it’s over-saturation and I had immersed myself in the genre too long. Who knows, these things happen. But when I saw that they were going to broadcast a TV adaptation of the book on Easter Monday, I picked it off the shelf and thought I’d finish it before watching. I was on holiday too and should have had plenty of time, but oh no, it wasn’t to be. Too much time yet too many other things to do and I kept faffing around with my reading choices. But I started reading the book a few days later and although I was overwhelmed by all the detail at first, once I got into the rhythm of the book, it fast became a page-turner. Although I confess I was at first surprised that a non-fiction crime book could have taken the reading public by storm, I can see why it took hold of the readers’ imagination. Summerscale is brilliant at keeping the tension at just the right level to keep you turning the pages. I too wanted to know who had murdered the little boy. 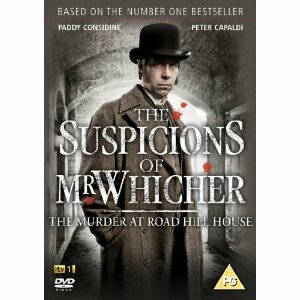 The Suspicions of Mr. Whicher or The Murder at Road Hill House is based on true events in the 1860s when 3 year old Saville Kent is found missing from his cot. His nurse who was sleeping in the same room with her charge, Saville’s baby sister, awoke to an empty cot and assumed his mother had picked him up and taken him to her room as his blanket was folded neatly and with care. However, the alarm was soon raised that little Saville was missing and he was later found stuffed down the outdoor privy used by servants and passing tradesmen. His throat was cut and there was a bloody flannel nearby. The local police are unable to find the murderer and, ever mindful of hurting the reputations of Mr. Samuel Kent, a local factory inspector, and his household, act in a questionable manner detrimental to the investigation. However, rumours soon begin to circulate regarding the household (which consisted of his second wife and his many children from his two marriages who were not treated equally) and Scotland Yard sends their brightest detective to rural Wiltshire to solve the case. What I found fascinating about this book was the way Summerscale shows how the formation of detectives, still a new job description within the police, was met with suspicion from local police and journalists, and excitement from writers such as Charles Dickens and Wilkie Collins who incorporated detective characters based on Whicher in their fiction. It was still a fine line as the the police kept clear demarcations as to what was considered acceptable when making enquiries whereas detectives who were in plain clothes were able to pry into household affairs previously thought of as private and beyond their reach. As Mr. Whicher makes his enquiries, it becomes clear that he believes Samuel Kent’s youngest daughter from his first marriage, Constance, has something to do with Saville’s disappearance and murder. Constance, at sixteen, has had to deal with her mother’s apparent mental instability, her death, the marriage of her father to her former governess and the birth of their children displacing her father’s affections, and had previously tried to run away to sea with her brother. She is strong and intelligent and it seems Mr. Whicher has met his match. You’ll have to read the book yourself to find out the outcome. What I was left with, which I found unexpected, was how solitary being a detective was, even if you were as celebrated as Mr. Whicher. You worked alone encountering obstruction from the suspects as well as from those who were supposed to aid you. And I was sad at how Mr. Whicher’s brilliant career unfurled due to circumstances beyond his control which, in my opinion, were grossly unfair. As you can see, I have a soft spot for Mr. Whicher. I finally caught up with the TV adaptation after finishing the book and I have to say that Paddy Considine, who plays Mr. Whicher, did an admirable job at portraying the detective. It was a pretty good adaptation and I felt that it wasn’t as ambiguous as the book, which left me with a lot of unanswered questions. I guess that’s the difference between fiction and fact. You may also want to check out teadevotee’s post about both the book and film. I’ve been meaning to read this book for ages, since I finished The Night Watch last year (which I loved, loved, loved), and had heard many nice things about it, and I finally did! And since I also wanted to watch the TV adaptation, I thought I’d post a joint review similar to that posted by su[shu] for Murakami Haruki’s Tony Takitani. Unlike the majority of Sarah Waters’ fans, I fell in love with her writing starting with The Little Stranger followed by The Night Watch. I had previously read Fingersmith when it was first published in 2002 and don’t recall it having any serious impact on me. But it looks as though Fingersmith seems to be everyone’s favourite book, so I’ve got a copy on standby for a re-read in the near future. There is something magical about Waters’ prose. It starts out quietly, silently and slowly draws you in, deeper and wanting more. That was how I felt when reading Affinity. The Night Watch had such an impact on me that I thought somehow I may have been spoilt and not find Affinity as enjoyable. Certainly the style was different, and so was the setting and plot. 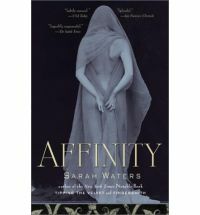 But Affinity had such atmosphere and, like the main character Margaret, I was completely taken in. The story begins with Margaret Prior, a spinster in her late twenties, who is recovering from her beloved father’s death. To occupy herself, she has volunteered to go and spend some time talking to and helping the female inmates of Millbank Prison. Here she meets women outside her social circle and discovers Selina Dawes, a spiritual medium who is serving five years for causing harm to a young girl and, indirectly, the death of her patron. Margaret is fascinated by Selina who insists that it was Peter Quick, her spirit conduit who was to blame. In the stifling atmosphere of Millbank Prison, Margaret finds herself drawn to the beautiful girl and soon experiences strange occurrences that can only be attibuted to the work of spirits. Can this be real? And will she be able to save Selina? Although Waters’ writing is wonderful, I found the book to be rather slow at the beginning. It is only after finishing the book that I realised what a genius Sarah Waters is. The plot is constructed in such a clever way that you are Margaret, and you fall in love, you start to believe in the spirits Selina sees and then you realise suddenly what has really been happening. It all slots into place and you are left reeling, wondering why you never saw what was plainly there in front of your eyes. Really, you have to read this book. And please read it before you watch the TV adaptation. 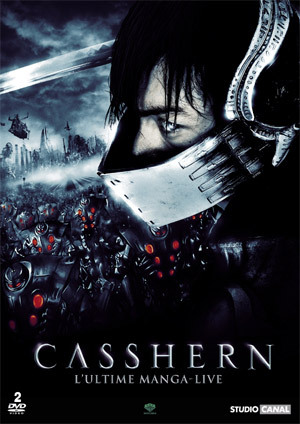 Because although the adaptation was good, it just isn’t as good as the book. I thought the casting of Anna Madeley and Zoe Tapper as the two main characters in the TV adaptation was brilliant. The script was written by Andrew Davies who also wrote the scripts for Pride and Prejudice (the one with Colin Firth) and Bleak House, both of which I loved. But somehow, you lose something in the translation and I found it a little wanting. As so often happens, I noticed a couple of changes which I felt may have been necessary for the adaptation but changed the meaning of the story a little. However, the cinematography was beautiful and I think it captured the spirit of the book. It was interesting to watch the DVD straight after reading the book to compare them, but maybe it might have been better if I had let a couple of weeks dampen my enthusiasm for the book so that I could have given the DVD a chance. What do you think? Here is an interesting article about Hypatia of Alexandria, a renowned teacher of mathematics, astronomy and philosophy. 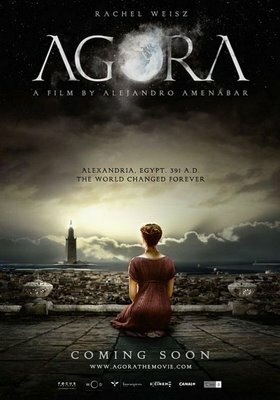 I’m looking forward to watching Agora starring Rachel Weisz about the life of this great 5th century thinker (if it’s ever released in the UK). It’s almost the end of the year and the time for lists, so I thought it would be appropriate to list my most enjoyable reads of the year. There haven’t really been any duff reads and I think I only gave up on two books earlier in the year before I started my blog in July. 1) The most enjoyable thing this year was starting my blog! I was really nervous about this and, having been surreptitiously reading book blogs for about a year beforehand, I felt rather intimidated at the professional manner in which many blogs are maintained. They are all so lovely, funny and well thought out. But I took the plunge and I’m really glad I did, because it’s so much fun and I’ve met some incredibly nice bloggy people. It’s made me think a lot more about why I read and the books that I choose. I also found it surprisingly hard to write a negative review and made me think about the honesty in my writing. 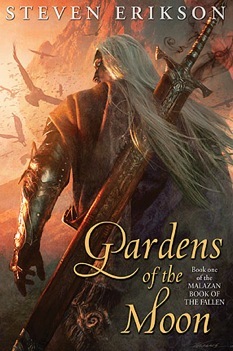 I realise that I haven’t written about my favourite book of the year, Gardens of the Moon by Steven Erickson since I read it way back in January, but as I’ll be reading the second installment in the 10 book sequence next year, I promise to write a big juicy post about the Malazan Book of the Fallen series when the time comes. 3) I found some amazing book challenges this year including RIP IV and the Japanese Literary Challenge 3 which put me in touch with some lovely people, the Clear Off Your Shelves Challenge which actually motivated me to read something off my TBR shelf and the Women Unbound Challenge which has made me veer towards some thoughtful reading. I’m also enjoying the Hello Japan! challenge which has made me look at Japan anew. 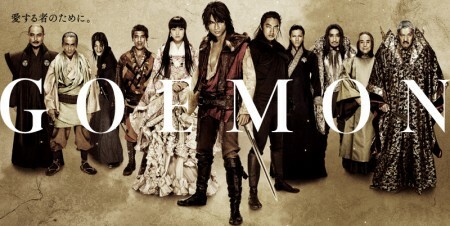 4) I also reconnected with my love for Japanese drama and film. This year’s favourites were Crows Zero, Sakuran and Gokusen. And I’ll leave you with my favourite book and cover art of the year.